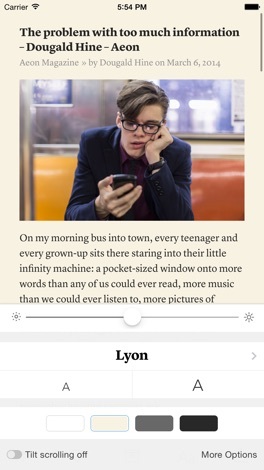 Developer : Instapaper Holdings, Inc.
"I have no time right now, I'll read it later"
Instapaper, powered by Tumblr developers, allows you to save webpages, articles and any other resource to read them later, even offline. What's more, it provides a good-looking and friendly layout for making easier reading all that resources. A layout which is highly configurable. What could be the added-value feature of Instapaper? I would say a high compatibility and integration. There are already lots of browsers plugins and alternative apps that makes things easier. What's more, it's backed by a professional team of developers. Regarding features: Instapaper allows you to save to read later lots of resources just by tap "share" button and then selecting Instapaper or through browsers plugins. Likewise, you can add folders and tags to organize your articles, save worthy articles in the archive after reading them or like them. From setttings you can enable "dark mode" manually or automatically at night. You can re-download articles manually too, sort articles, set prompting and set up download limits. 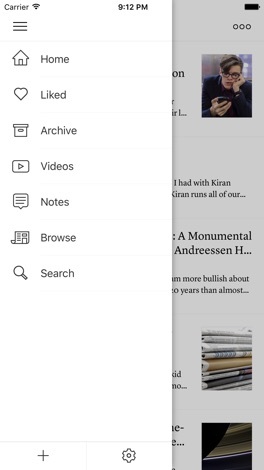 In summary: Instapaper is set in a good-looking and highly configurable layout, it's simple and user-friendly and it's fully integrated with other resources. Highly recommendable. - Find that great quote you want to remember and share? Instapaper makes it easy to highlight text in any article. - Control text-to-speech right from your Apple Watch.